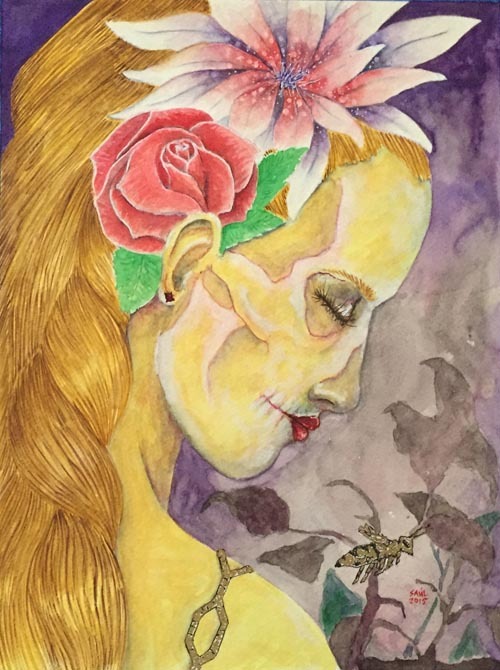 6pm—Opening Reception Corazon de Los Angeles (Olvera Street) Annual Dia de Los Muertos Art Exhibit featuring more than a dozen artists, including George Yepes, Maria Kane, Michael Stubbs, Dave Sanchez, Oscar Castillo, and many others. Come early for festival & dinner. Corazon LA is located at W-19A on Olvera Street, Second Level: 624 N. Main St. LA 90012. For more info, call (213) 617-0227 or visit on Facebook. Saturday, July 25—10:30am-7:30pm—New Frida Kahlo Exhibit Joins George Yepes Group Show at Corazon de Los Angeles at the historical Olvera Street Marketplace in Downtown Los Angeles. 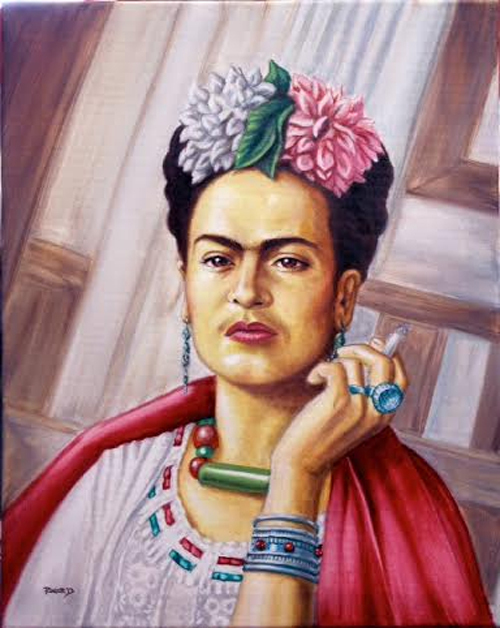 New paintings, folkart, jewelry, accessories as art in celebration of Frida Kahlo’s birthday. Free & open to the public. All Frida Kahlo themed nichos and jewelry 20% off. Corazon LA is on the Second level –up the stairs at W-19A. For more information, call (213) 716-0227, email info@ corazonla.com or visit Corazon de Los Angeles’ Facebook page. It’s a perfect match. George Yepes will unveil his latest work at Corazon de Los Angeles, historic Olvera Street’s newest gallery on Saturday, June 27, 6:00 – 9:00 p.m.
Uniquely, this fine and folk art gallery and cultural marketplace, exhibits the work of well known veteran artists alongside emerging artists who reflect the beauty and depth of Latino history, life and culture. Yepes is using every minute of his time to paint new work leading up to this show while coordinating the work of some of his former students. He is planning a surprise unveil that may include a new “celebrity” portrait. “We are very pleased that an artist as acclaimed as George Yepes will be showing his very latest work at Corazon de Los Angeles,” said co-owner Gloria Alvarez. “The philosophy of our gallery, to showcase a blend of artists, is in complete agreement with his work to teach and inspire new artists,” said Alvarez, whose partners include husband Mike and cousins Pat Soto Lee, Debbie Soto Seanez, Manuel and Steve Soto-all longtime L.A. area businesspersons. Corazon de Los Angeles has received high praise for being a welcoming place where people can be introduced to a range of authentic Latino art, whether they are longtime collectors or making their first art acquisition for a home. “All of the artwork in our gallery tells a story, we provide an environment that is casual enough to allow our customers to imagine what the work will look like in their home. We offer a variety of items for art lovers on every economic scale,” Alvarez said. “We can help our customers locate a fine art painting by a famous Master artist if we don’t currently have it in our gallery, or help them select a Mexican tapestry, pottery, jewelry imported from Peru, Mexico or by a local artisan. It’s all carefully selected and we pride ourselves in offering a kaleidoscope; a window into our wondrous diverse culture,” she said. This attractive new venue, now celebrating its third anniversary, is providing a supportive space for artists to make their artwork available for purchase. Yepes’ latest work is expected to be yet another milestone exhibit for the evolution of Chicano art with a new generation of artists who have been well schooled on technique and like Yepes, can say much with a paint brush. “What I like about exhibiting at Corazon de Los Angeles is that the gallery, true to its name, is located in the heart of Los Angeles. Olvera Street, the oldest street in Los Angeles, the birthplace of the city of Angels, and the center of a giant in the art world where East L.A. begins,” said Yepes. “The word is getting out that Chicano painters in Los Angeles should be exhibiting at Corazon de Los Angeles Gallery at Olvera Street … The heart of Los Angeles is a world art center, like New York, London, and Paris.” Yepes said. In a career now spanning forty years, Yepes’ work has taken him from East L.A. to Princeton, NASA, Dubai, and Hollywood’s Silver Screens. His paintings are in forty museum collections. He has always been an ambassador for Chicano art, from his early days as one of the original East Los Streetscapers to being sought after for the powerful images seen in feature films. His paintings are in the personal art collections of Hollywood’s most cutting edge actors and filmmakers including Sean Penn, Madonna, Patricia Arquette, Nicolas Cage, Cheech Marin, Anthony Keidis of the Red Hot Chili Peppers, Quentin Tarantino, and Robert Rodriguez. “The first time I stood in front of a Chicano painting – it was George Yepes’ Amor Matizado – I had the same feeling as when I first heard a tune by the Beatles,” Marin said. Salma Hayek, Johnny Depp, Antonio Banderas, Eva Longoria, Carla Gugino, Marley Shelton and Patricia Arquette have modeled for several Yepes paintings. Since the year 2000, Yepes has collaborated with Robert Rodriguez and Quentin Tarantino on numerous projects including Once Upon a Time in Mexico 2003; the double feature Grind House 2007; Machete 2010; and the 2014 Robert Rodriguez/Frank Miller movie, Sin City 2 “A Dame to Kill For”. 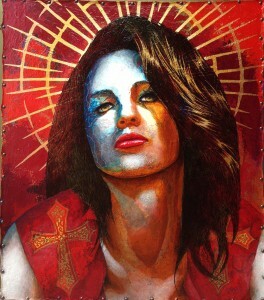 “George Yepes is the rarest of talents,” said Director Robert Rodriguez. “I own several of his paintings, and whenever someone walks in and sees them for the first time, I have to stand close so I can catch their jaws before they slam into the ground. George’s work grabs you by the lapels and makes you feel as if you’re discovering art for the first time. He’s a master painter in the best sense, the art comes through him not from him. That is rare,” Rodriguez said. “All are welcome to experience that ‘wind’ with Yepes and his former students at our exhibit at Corazon de Los Angeles,” said Alvarez. The exhibit runs through July and is free and open to the public. Corazon LA is located at the historic Olvera Street Marketplace –W19A (upstairs)/634 N. Main St. Los Angeles, CA 90012. 9:30am-1:30pm—Sign-up for Medi-Cal & CalFresh at the Eagle Rock Library. Eligibility specialists from the LA County Department of Public Social Services will help sign you up for Medi-Cal, Covered California, CalFresh, and other government assistance programs. Bring personal identification, verification of incomes/assets/expenses, and verification of residency. Library is located at 5027 Caspar Avenue, LA, 90041. For more info, call (323) 258-8078. 4pm–Los Angeles Derby Dolls, Sirens vs. Tough Cookies. Watch a game of Women’s track roller derby at 4900 Alhambra Ave, LA, 90032. For more info, visit Derbydolls.com/LA. 1-2:30pm—Free Parent Workshop: Choose Health L.A. Kids at Eagle Rock Library. Workshop will focus on the importance of early nutrition & physical activity for children 0-5 years old. Library: 5027 Caspar Avenue, LA 90041. For more info, call (323) 258-8078. 2-3pm—Sandy Lynn’s Musical Barnyard Extravaganza Comes to the East LA Library. Enjoy musical, educational & interactive show with live animals. Library located at 4837 E. 3rd St. LA 90022. For more info, call (323) 264-0155. 4-4:45pm—Annie Banannie Balloon Show at the Anthony Quinn Library. Comedy and storytelling mixed with amazing balloon twisting at library: 3965 Cesar E. Chavez Ave. LA 90063. For more info, call (323) 264-7715. 2:30-3:30pm—Good Sleep Workshop at Montebello City Library. Learn the importance of healthy sleeping habits. Library located at 1550 W. Beverly Blvd., For more info, call (323) 722-6561. Mariachi High Presents Point of View Film Program June 18 at the Montebello Library. Film follows a year in the life of the mariachi ensemble at Zapata High School on the Rio Grande in South Texas. Time: 2-3pm. Library is located at 1550 W. Beverly Blvd Montebello, 90640. For more info, call Beth Krupsaw (323) 722-6551. Teatro Urbano Presents Detective Sanchez: The Ortiz Case a Chicano Mystery June 19. Entertaining theater for everyone. Time: 8pm. Location: 2005 East 1st St. Boyle Height, LA, 90033. For more info & to RSVP, call (909) 286-7613. 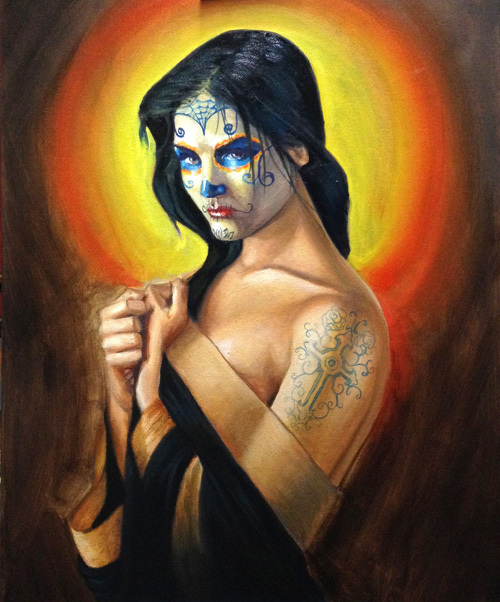 Corazon de Los Angeles Celebrates 3rd Anniversary Show June 27 Featuring an Exhibit of original works by George Yepes and Juan Solis, Gene Ortega, Maria Kane, Saul Aguilera, Ricardo Estrada, Ulie Garcia, and Ben Morales. Opening reception from 6-9pm. Meet the artists; light refreshments, music. Free admission. Corazon LA is located at W-19a (upstairs) on the historical Olvera Street market place. (634 N. Main St.) L.A. For more info, email info@corazonla.com, call (213) 617-0227 or visit on facebook: Corazon’s Facebook page. Real Estate Community Expo June 27 at Ross Hall in Bell Gardens, 10am-3pm. Learn the house buying process & about your buying power in 30 minutes. Ross Hall: 6662 Loveland St. Bell Gardens 90201. For more info, call (562) 806-2355. El Sereno Independence Day Parade on June 27th begins at 10am on Huntington Drive & Van Horne Ave. and ends at El Sereno Park. Concert begins at 4pm at the park. Fireworks show begins at dark. For more info, CD 14 Deputy Julio Torres at (323) 226-1646. 7pm- A Noise Within Theatre Announces Free Summer Reading of The Dresser by Ronald Harwood, 3352 East Foothill Blvd., Pasadena, CA 91107. RSVP via phone to 626-356-3100 x1 to reserve your seat. To submit an event to the Community Calendar, e-mail calendar@egpnews.com. All submissions are subject to space availability. Paid advertising available for guaranteed calendar placement. For more information, email advertise@egpnews.com or call (323) 341-7970. Traditional and not so traditional Mexican pottery have been given a new look and will be featured in a new exhibit opening Saturday at Corazon de Los Angeles gallery, home decor and cultural gift store at the historic Olvera Street Marketplace. 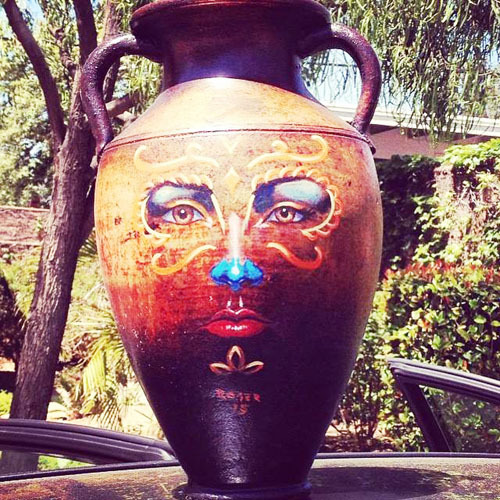 Artists from the greater Los Angeles area have created beautiful new art pieces using Corazon LA’s imported Mexican pottery for the store’s 2015 Spring Showcase. Traditional terracotta planters, designer vases, ceramic wall hangings, vases, candelabras, have been transformed with colorful brush strokes, creating new, one-of-kind pieces. The exhibit will also include new paintings and multi-media pieces. Many of the artists will be stopping in throughout the day and will be available to discuss their pieces. 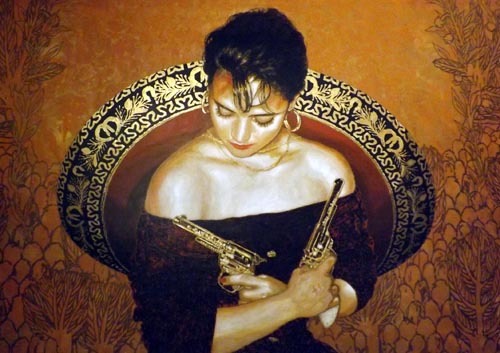 Featured artists include George Yepes, Richard Valdes,Roger Trivinos, Richard Martinez, Maria Kane, Saul Aguilera, Oscar Castillo, Ivan Godinez, Mauricio Lopez, Melody Smith, Sergio Hernandez, Claudia Cox, Elza, Violeta Moreno, Lorena Rivera, Rebecca Lozano. This is a wonderful opportunity to purchase original art that fits right into your home. As an added bonus, Corazon LA is offering 20% off all pottery in the store (original art excluded). Check Corazon LA facebook page for details. Corazon LA is located at 634 N. Main St – W-19A (Upstairs) on Olvera St. LA 90012. 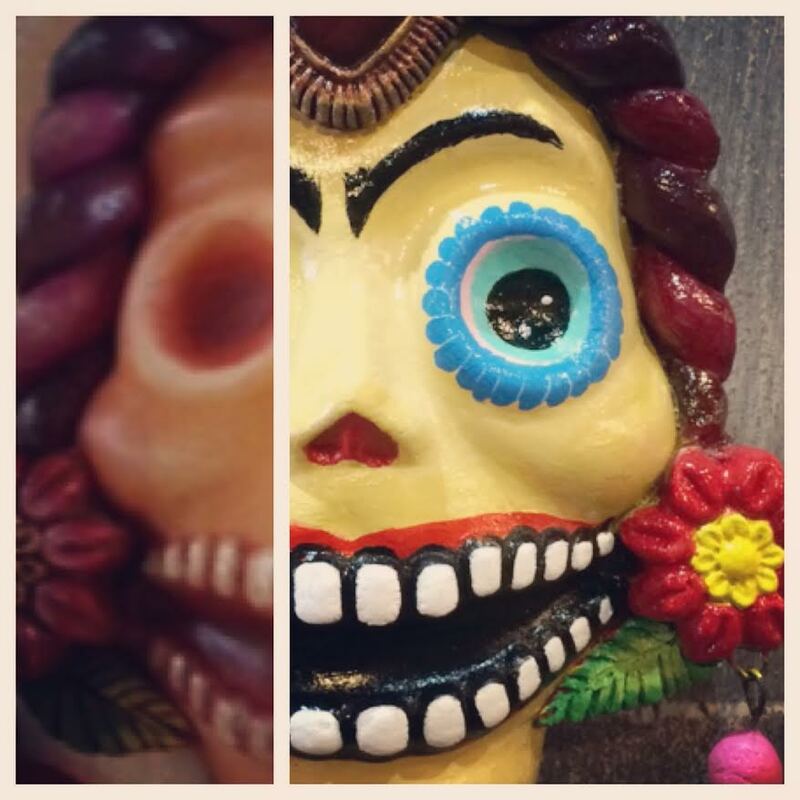 For more info, call (213) 617-0227 or email info@corazonla.com .Follow us on FB, Twitter, Instagram. * Art on display subject to prior sale. 10am–Grand Opening Chicana Service Action Center WorkSource Center in Boyle Heights & 6th Street Bridge Job Fair. Learn about jobs with the 6th Street Bridge Construction Project. Bring copies of your resume. Also learn about small business assistance available from the Business Source Center. Location: 1505 E. 1st Street. For more info call (323) 526-9332. 11am-2pm–Affordable Care Act Enrollment Information at Montebello Chet Holifield Library. Certified educators will provide information and answer questions and concerns. Open enrollement for 2015 begins Nov. 15 and runs through Feb. 15. Library is located at 1060 S. Greenwood Ave. For info, call (323) 728-0421. Library. Join the Friends of the Library at this event that will feature gently used books and other items for sale. Event will also be held Dec. 13 at 11am. Library is located at 3965 Cesar E. Chavez Ave. LA 90063. For info, call (323)264-7715. 1-3pm–Family Holiday Art Activities at City Terrace Library. Invite the whole family to participate in different art activities with a holiday theme. All supplies will be provided. Library is located at 4025 E. City Terrace Dr. LA 90063. For info, call (323) 261-0295. 6-7pm–Free Zumba Class at Anthony Quinn Library. Join the fun with a certified Zumba instructor. Beginners welcome. Open to ages 11 and up. RSVP at the information desk. Library is located at 3965 Cesar E. Chavez Ave. LA 90063. For info, call (323) 264-7715. 6-7pm–Holiday Card Workshop at East Los Angeles Library. Make your own cards to send to friends and family. All materials will be provided. Library is located at 4837 E. 3rd Street, LA 90022. For info, call (323) 264-0155. 11am-2pm–Affordable Care Act Enrollment Information at Anthony Quinn Library. Certified educators will provide information and answer questions and concerns. Open enrollment for 2015 begins Nov. 15 and runs through Feb. 15. Library is located at 3965 Cesar E. Chavez Ave. LA 90063. For info, call (323) 264-7715. 4-7pm–Piñata Factory at Bell Gardens Neighborhood Youth Center. Learn to make your own mini piñata using recycled newspaper, paint and glue. Event is free for ages 7 to 15. Center is located at 5856 Ludell St. For info, call (562) 806-7667.